The company also owns a 42% stake in PS Business Parks (PSB), which leases out commercial space to small and mid-size businesses, and 35% of Shurgard Europe, which owns Public Storage's European properties. In total, Public Storage serves over 1.5 million customers. The company's business model provides great short-term visibility because customers typically sign month-to-month leases. This gives the REIT some protection against inflation because it can continually adjust rents within reason to account for higher costs. While Public Storage doesn't raise its dividend every year, it has reliably paid uninterrupted dividends since 1981. 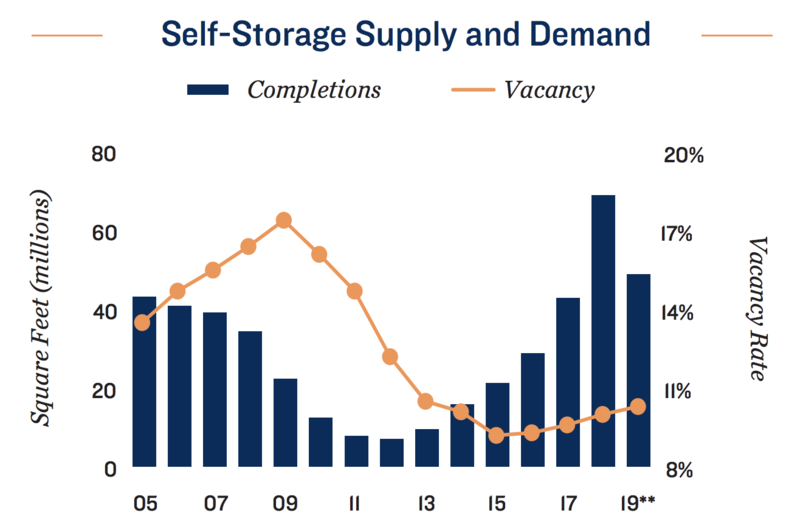 Increased population density and an aging population have helped drive the surge in storage properties, providing a nice tailwind for Public Storage. However, there's much more to the company's story. Public Storage looks like a dependable business for several reasons, starting with its sheer size. The firm is larger than its top three competitors combined and locates many of its facilities in close proximity to each other, which allows it to leverage its costs (property management, maintenance, and advertising) across the company to achieve better profitability. Public Storage also focuses on major metropolitan areas with favorable demographics. Over 70% of the company's same-store revenues are generated in the 20 metropolitan areas with the highest population levels. These areas are characterized by better incomes, greater population density, and faster growth rates. They also provide consumers with easier access to storage since they are conveniently located (customers store their goods within a five-mile radius of their home or business, according to the company). The company's well-recognized brand and market concentration, combined with the highly fragmented nature of the industry, mean that Public Storage is more likely to appear in unpaid search results for self-storage as well, lowering its cost to acquire new customers. That's an increasingly important advantage as online marketing channels now drive more than 70% of move-ins for the company. Switching costs, in terms of moving to a new storage facility, are relatively high as well, including a full day of moving and usually a truck rental. Thus most people are not willing to do so even after receiving notification that rent is increasing. Basically, few consumers are willing to deal with the hassle to move to a rival facility to save $10 to $15 per month, resulting in high retention rates. In fact, nearly 60% of Public Storage's customers rent for at least a year, According to CEO Joe Russell. In addition to the company's impressive profitability and cash flow generation, its management team has remained disciplined in the company’s expansion. Public Storage has uniquely positioned itself to take advantage of its growth opportunities thanks to the way it has managed its capital structure. Specifically, management has historically raised most of the company's growth capital not from debt or common equity, but through issuing preferred shares. Essentially, Public Storage’s management has taken a conservative approach to debt that helps to maximize the company's long-term growth, results in a very safe dividend, and will likely protect it should the corporate credit market ever freeze up, as it did during the financial crisis. For all of these reasons, Public Storage has been able to pay uninterrupted quarterly dividends for more than three decades. This explains why Public Storage has steadily pulled back on growth spending in recent years. According to management, 2019 is likely to see similar new property completions as 2018 (about $5 billion worth), which means that in the short term the industry's struggles with falling pricing power are likely to continue. Fortunately, growth spending industry-wide has started to slow, meaning this problem should lessen in the coming years. For investors, this well-known oversupply risk means Public Storage's cash flow and dividend growth rate will likely remain somewhat below its long-term averages for at least the next year or two. Low single-digit growth in same-store NOI is a reasonable expectation and should help keep the industry stable by avoiding excess capacity build outs in the future. However, it's really hard to know when today's growing supply and demand imbalance will abate. Until then, continued rent growth and occupancy rate deceleration could persist, causing storage stocks to see their valuation multiples re-rate lower. And with fewer attractive growth opportunities to pursue, Public Storage's organic growth is all the more dependent on strong pricing power, which could weaken as well. Investors need to be prepared for top-line growth to slow unless a more substantial decline in storage REIT prices allows management to acquire one of its major rivals such as Extra Space Storage (EXR), CubeSmart (CUBE), or Life Storage (LSI). Finally, while not a risk to the business, income investors considering the stock should note that Public Storage does not raise its dividend every year. In fact, the REIT hasn't increased its payout since late 2016. While PSA's dividend is one of the most secure in the sector, this means that anyone desiring annual dividend increases to help offset inflation could be disappointed. There's a lot to like about Public Storage. Its business generates recession-resistant cash flow, owns premier real estate locations, is managed conservatively, has a solid balance sheet, and should have a long runway for growth given the industry's fragmentation. However, concerns over new industry supply are unlikely to dissipate anytime soon and could continue to weigh on the firm's short-term dividend growth prospects. 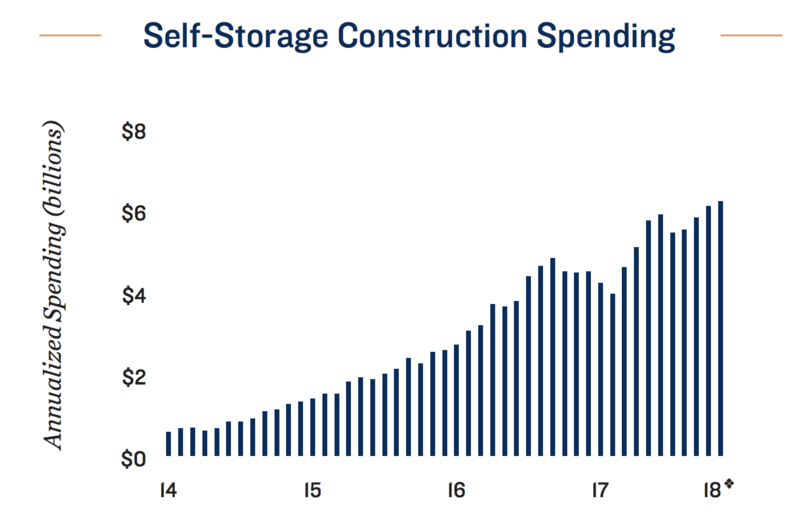 The good news is that investors are largely aware of this risk and have already re-rated the valuation multiples of self-storage stocks lower in recent years. What's less certain is how long this imbalance will persist, especially since the industry is largely in uncharted territory from a supply perspective. Public Storage appears to have the financial strength and discipline to withstand almost any headwind while continuing to pay reliable dividends, but an investment in the company could require a good deal of patience as the storage industry's unique fundamentals continue to adjust.